I’ve been in Poland and England on a very successful speaking tour — all SRO crowds. 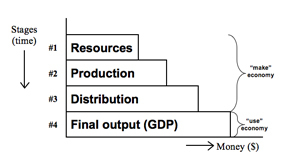 In Poland, thanks for Jan Fijor, many of my books have been translated….In London I spoke at the Adam Smith Institute on “Austrian economics for Investors” and the Institute for Economic Affairs on “Hayek vs. Keynes: Who’s On Top?” Needless to say, in today’s crisis mode, Keynes and Keynesian economics are clearly on top. Adrián Ravier, a professor of economics at Francisco Marroquin University in Guatemala and the National University of La Pampa in Argentina, has just completed a major interview with me on my life and contributions to economics, finance and the freedom movement. It will appear in the third volume of “LA ESCUELA AUSTRIACA DESDE ADENTRO: Historias e ideas de sus pensadores,” edited by Adrián Ravier and to be published later this year by Union Editorial in Spain. Please click here for the entire interview. I’m happy to report that FreedomFest 2011 was another rip-roaring success. With highlights featuring Senator Rand Paul, Judge Andrew Napolitano, John Mackey (CEO, Whole Foods) and Peter Thiel (founder, PayPal), among many others, the nearly 3,000 attendees had non-stop opportunities to learn, discuss and generate new ideas on liberty and freedom. We also had the premiere of the Anthem Film Festival, with over 30 films screened. Winners and awards are listed on the Anthem Film Festival website. These narrative and documentary films had terrific messages, strong storylines and interesting concepts that you don’t want to miss. Check out the website. And be sure to part of the Anthem Film Festival next year! Please see this youtube video, produced by Reason.tv (which was there for the entire conference, conducting fascinating interviews), entitled “What We Saw at FreedomFest” for a nice recap of the conference. If you have never attended FreedomFest before, please consider joining us next year, when we celebrate the Wild West at FreedomFest 2012, July 11-14, at Bally’s in Las Vegas. (Just think 7-11 in Vegas!) And to all our regular attendees, we look forward to meeting up with you once again in Vegas for FreedomFest. Meanwhile, keep protecting our liberties…stay free! WHO IS THE PERSON OF THE CENTURY? Time magazine will decide this month who is its “Person of the Century.” The issue was raised at the New Orleans Investment Conference last month. There I had a chance to meet Stephen Ambrose, author of best-selling books such as D-Day, Undaunted Courage and several presidential biographies. His choice is Dwight D. Eisenhower. According to Ambrose, Eisenhower was the right person to make the decisive decisions in World War II (such as D-Day), and fought to keep America out of war with the Soviet Union in the 1950s. Ambrose, who was Eisenhower’s official biographer, says that on several occasions during his administration his advisors and members of Congress demanded that he act militarily against Russia. But he refused, saying it would have been a bloodbath and the end of Western civilization. Eisenhower told his advisors, “Soviet communism is a great evil, but it cannot survive our system of democratic capitalism. We must be patient and it will die on its own.” He was eventually proven right. I certainly think Eisenhower is a better candidate than Franklin Delano Roosevelt, who got us into World War II as a way out of the Depression, and started us on the road to big government with Social Security and other New Deal programs. I think Winston Churchill is a much better candidate as a world leader, and far less divisive. On the closing panel in New Orleans, newsletter editor Larry Abraham named C. S. Lewis as the Person of the Century for his classic works in defending liberty and moral faith (The Screwtape Letters, Mere Christianity, Chronicles of Narnia). I like Larry’s idea of choosing a person who was a great influence for good in the 20th century, rather than picking political leaders who did a great deal of harm, such as Lenin or Hitler. In this regard, I would definitely choose Winston Churchill over Franklin Delano Roosevelt, or in economics, Friedrich Hayek over John Maynard Keynes. The highlight of this year’s New Orleans conference was spending time with the actor Charlton Heston. My wife, Jo Ann, and I had the chance to have lunch with this famous actor. In his 76 colorful years, he has made the same number of films! My favorite is Ben Hur, which in my judgment is the film of the century. It deservedly earned 11 Academy Awards, more than any other in history. In his talk, Heston warned us that our liberties are at risk in this era of Big Government. “The government encourages irresponsibility,” he stated. “As citizens, you need to spend the same time and effort defending your freedoms as you do on your investments.” Good advice! What a pleasant conversation we had when I had dinner with Dan Quayle earlier this year. Quayle didn’t dominate the conversation as my wife Jo Ann and I might expect from a former Vice-President; he was gracious and a good listener. Dan talked about his support for some form of private Social Security accounts for younger workers, under the age of 40. Jo Ann and I had met Dan Quayle 10 years earlier at a Howard Ruff conference, and we talked about those days and what Howard was up to these days. Jim Blanchard and I met privately with Steve Forbes at the 1997 New Orleans Investment Conference. Forbes is planning to make another bid of the presidency in 2000 (which came to pass though he dropped out after low showings in the first round of Republican primaries and caucuses), and we assured him the hard-money movement was behind him 100%. Like me, he is bullish on US technology, and his formula for “hope, growth and opportunity” can only improve the prospects for America — a flat 17% tax with generous deductions, privatization of Social Security, and sound money. Speaking of sound money, I presented Steve with a 1880 Morgan silver dollar and he was delighted to see that the date was the year his grandfather, B.C. Forbes, founder of the magazine, was born. Since this first meeting, I have met with Steve Forbes several times, as he is a huge supporter of FreedomFest. He has attended all three days of the conference two years in a row, participating on panels, giving keynote addresses and listening in on other sessions. 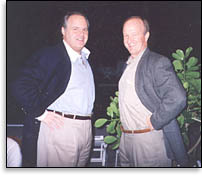 I guess my dinner conversation with Rush Limbaugh early in 1998 had quite an impression on the radio talk host celebrity. During dinner we discussed a variety of economic and political topics, including the Clinton legacy. I told Rush I thought Clinton’s biggest achievement would be the privatization of Social Security. Needless to say, Rush thought I was crazy. Clinton? Known for privatizing anything? On the following Monday, Rush talked about our conversation on his radio program, referring to me as “a financial guru from Orlando” and scoffing at my prediction. But low and behold, I have been vindicated by Rush. In a recent broadcast, Rush again mentioned me (this time as a “financial planner from Orlando.”) It seems that some of the Clinton administration have suggested the privatization of Social Security (like it’s a brand-new concept) could solve the New Deal program’s woes. I was Clinton’s Running Mate…For Half an Hour! In the world of investing, timing is everything. 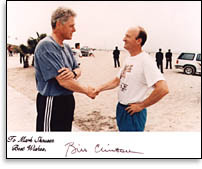 In October, 1996, on a San Diego beach, my timing was excellent — an opportunity to jog and speak with President Clinton. I had gone out on the beach for a jog. Before I knew it, the President of the United States and his entourage came jogging in front of me. “Hi! How are you?” Clinton asked with a smile. “I could be better,” I responded, a phrase that speaks volumes about the last four years under Clinton. For the next half an hour, I had the president’s ear. Boy did I let him have it! We discussed his 1993 tax hike, which I pointed out had a negative effect on business and charities. While wealthy people can afford to pay higher taxes, sending more money to Uncle Sam means there’s less money to be spent on business, on hiring or for charities. He seemed to understand, but said he had to do something about the deficit, which ballooned under Reagan supply-side tax-cuts of the 1980s. We also discussed a reduction or elimination of the capital gains tax. Surprisingly, Clinton said he favored a reduction in capital gains, but only if a “small” alternative minimum tax was included to ensure fairness. Basically, a capital gains tax cut in name only. Next we discussed problems of Medicare, including the Medical Savings Accounts idea popularized by 1996 and 2000 GOP presidential candidate Steve Forbes, which Clinton said he also supported. As we finally said good-bye (the Secret Service agents had been pointing at their watches for the last several minutes) I asked Clinton to sign a dollar bill I had in my pocket. “I think it’s illegal, but I’ll do it anyway,” he said.